Harry Truman was the 33rd President of the United States who served in office from April 12, 1945 to January 20, 1953. What was the life of Harry Truman like? The short biography of President Harry Truman covers important information and facts about his early life, his family, career and the famous events and achievements of his political life. 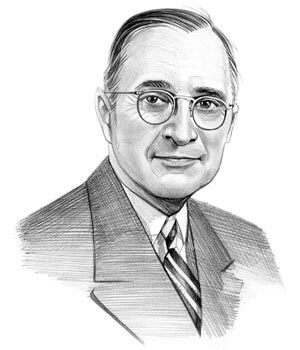 Our short biography of Harry Truman provides an interesting and easy way to learn about the life of the President. The following important facts provide a fast overview of important facts about President Harry Truman. Facts and Info: Harry S Truman was the 33rd president of America who made the decision to drop the atomic bomb on Japan leading to the end of World War II. On his desk, Truman had a plaque that said "The Buck Stops Here." For additional info refer to 20 Facts about Harry Truman. Facts and Info: Harry S Truman was born May 8, 1884 in Lamar, Missouri. He was raised on the modest family farm with his brother and sister. Their house had neither electricity nor indoor plumbing. He rose to great heights from this humble beginning. Harry S Truman died on December 26, 1972 in Independence, Missouri. Facts and Info: The career of Harry Truman included the roles of Soldier, Farmer, Businessman, Politician and Statesman. He received an excellent education at the University of Kansas City Law School. Harry wanted to attend West Point, but his poor eyesight prevented him from achieving this goal. He did, however, serve in the military during World War I. He became the 33rd president of America in 1945, following the death of Franklin D Roosevelt, and served for 8 years until 1953. Facts and Info: Harry Truman married Elizabeth Virginia Wallace, who was called Bess, on June 28, 1919. Truman first began courting Bess Wallace at high school. They became engaged in 1918 and married a year later. They had 1 child called Mary Margaret. Facts and Info: Harry Truman belonged to the Democrat Political Party. He was 60 years old when he was inaugurated as the 33rd president. Inauguration is a president's swearing-in ceremony. Barkley stood as the Vice president. Harry Truman was subject to an assassination attempt in 1950. For additional facts refer to his Presidential Cabinet members. Short Biography of Harry Truman: What he was like! Facts and Info: Harry Truman was 5 feet 9 inches in height and weighed approximately 167 lbs. He had steel-gray hair, hazel eyes and wore thick, rimless glasses. His nickname was "Haberdasher Harry" due to his fondness for bright-colored shirts and bow-ties. He was well known for his integrity, honesty, and efficiency. His nickname was "Give ’Em Hell Harry" and his most famous quote was "The buck stops here". He enjoyed spending his leisure time playing cards and sailing trips on the presidential yacht Williamsburg. Facts and Info: During his lifetime he played a key role in important events of the era. Harry Truman was instrumental in the decision to drop atomic bombs on Hiroshima and Nagasaki on August 6 and 9, 1945 which saw the end of World War II. The creation of the United Nations followed as did the Nuremburg Trials which prosecuted prominent leaders of the defeated Nazi Germany. The later part of his presidency saw the beginning of the Cold War in 1946 which was a state of political hostility that developed primarily between the USA and the USSR and lasted until 1991. Soviet intervention in Greece and Turkey gave rise to the Truman Doctrine in 1947 that stated that the US should give support to countries or peoples threatened by Soviet forces or communist insurrection. The end of his presidency saw the Korean Conflict which lasted from 1950 to 1953. After WW2 the Korean Peninsula, which had been under Japan's control, was divided between a Soviet-backed government in North Korea and an American-backed government in South Korea. A series of bloody conflicts along the border erupted into the Korean War in 1950. An armistice was signed three years later ending hostilities and effectively making the division permanent. Facts and Info: During his life Harry Truman suffered from diphtheria, sleeplessness, gall bladder disease, a hernia and lung congestion. Diphtheria is an infection of the throat and nose caused by bacteria. In the early 1900s diphtheria caused more deaths than any other infectious disease so Harry Truman had a lucky escape. Facts and Info: Harry Truman died of Heart Failure on December 26, 1972 in Independence, Missouri. He was 88 years old. The former president's body lay in state at the Truman Library in Independence, Missouri. He was buried in the courtyard of the Harry S Truman presidential Museum and Library. His wife, Bess Truman, was buried alongside him in 1982. The short biography of Harry Truman provides a fast overview of the key facts and events about his life and the accomplishments of his presidential term in office. The following Harry Truman video enables you to sit back and listen to the history of his personal and political life - a useful educational resource for kids, children and schools learning about the life of President Harry Truman.